The American Hospital Association (AHA) has honored 19 hospital volunteer programs with its 2018 Hospital Awards for Volunteer Excellence (HAVE). 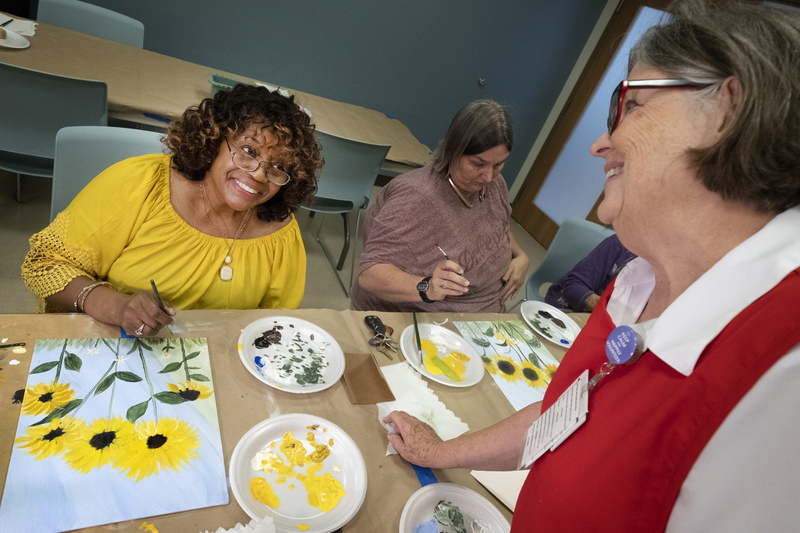 Navicent Health’s volunteer-led art therapy program for cancer patients is among those recognized nationally for positively impacting the lives of patients and communities through volunteer service. “Our volunteers play an integral role at Navicent Health, assisting patients, staff and visitors in a variety of ways and also raising funds for patient-centered causes. Our art therapy volunteers are shining examples of what it means to give of your time, your talent and yourself for the benefit of others. We are honored that the American Hospital Association has called national attention to their efforts,” said Dr. Ninfa M. Saunders, President and CEO of Navicent Health. Established in 2012, the art therapy program has a goal of helping cancer patients cope with the stress of diagnosis, treatment and recovery through artistic expression. Volunteer Mary Parks implemented and manages this program, recruiting and training a team of volunteers to provide art therapy for cancer patients. Although the program began as a service for patients receiving chemotherapy at Navicent Health’s Infusion Center, it has since expanded to include classes for cancer patients at Wellness Center, Navicent Health and a support group for patients and their loved ones at Peyton Anderson Cancer Center, Navicent Health. Parks and her team have also provided therapy sessions at community events and fundraisers. “Art therapy takes the participants to a wonderful place, and gets their mind off their cancer. We are often able to introduce something new to their lives – many have not picked up a paint brush since elementary school, but will take the skills they learn in art therapy home and continue to paint as they cope with cancer diagnosis and treatment. In their classes, they also mention how wonderful it is to fellowship with others walking the same journey. There are just so many benefits to this wonderful program,” said Parks. Art therapy provides each cancer patient opportunities for catharsis and comradery, as patients and survivors cope with the stresses caused by cancer. Data obtained at Navicent Health’s Infusion Center has shown patients’ blood pressure drops significantly as they begin working with an art therapist, allowing treatment to be more effective. “The program has been a tremendous success and a benefit for patients, Navicent Health, and the community at large. We have phenomenal volunteers who are dedicated to teaching and leading our patients and their loved ones in multiple settings. This program would not be possible without their efforts,” said Ron Lazar, Director of Oncology Services at Navicent Health. Those interested in joining Navicent Health’s volunteer team may visit www.navicenthealth.org/get-involved.html for information and an application. Highlight volunteers services that are engaged in improving healthcare. Encourage service that exceeds expectations as a result of innovation, creativity and leadership. Promote visibility and goodwill toward the hospital or health care system. Promote collaboration among provider organizations and community service entities to improve the quality of life of local citizens. The AHA is a not-for-profit association of health care provider organizations and individuals that are committed to the improvement of health in their communities. The AHA is the national advocate for its members, which include nearly 5,000 hospitals, health care systems, networks and other providers of care. Founded in 1898, the AHA provides education for health care leaders and is a source of information on health care issues and trends. For more information, visit the AHA website at www.aha.org. Founded in 1968, the Association for Health Care Volunteer Resource Professionals (AHVRP), a professional membership group of the American Hospital Association (AHA), is the premier membership society for health care volunteer services, retail operations and related support services disciplines. AHVRP provides timely and critical support through thought leadership, learning and knowledge sharing, professional development, certification, recognition for personal and professional achievements, networking, collaboration and advocacy resources for leaders in health care volunteer management as well as auxiliary leaders, volunteers, students, faculty and retirees who are interested in issues relate to healthcare volunteer resources, retail operations and advocacy. About Navicent Health Navicent Health was incorporated on November 17, 1994, as a nonprofit corporation whose primary purpose is to coordinate The Medical Center, Navicent Health and other affiliated entities in their mission of providing a comprehensive continuum of high quality, reasonably priced healthcare services to the region. Navicent Health has 970 beds for medical, surgical, rehabilitation and hospice purposes. The health system includes The Medical Center, Navicent Health, a nationally recognized tertiary teaching hospital; Beverly Knight Olson Children’s Hospital, Navicent Health, the region’s only dedicated pediatric hospital; Navicent Health Baldwin and Medical Center of Peach County, Navicent Health, both rural hospitals; Rehabilitation Hospital, Navicent Health, the region’s oldest and most experienced rehabilitation provider; Pine Pointe, Navicent Health, which provides palliative and hospice care in homes and in its facility; Carlyle Place, Navicent Health, the area’s first continuing care retirement community; Navicent Health Foundation, the philanthropic arm of Navicent Health; as well as diagnostic and home care services. 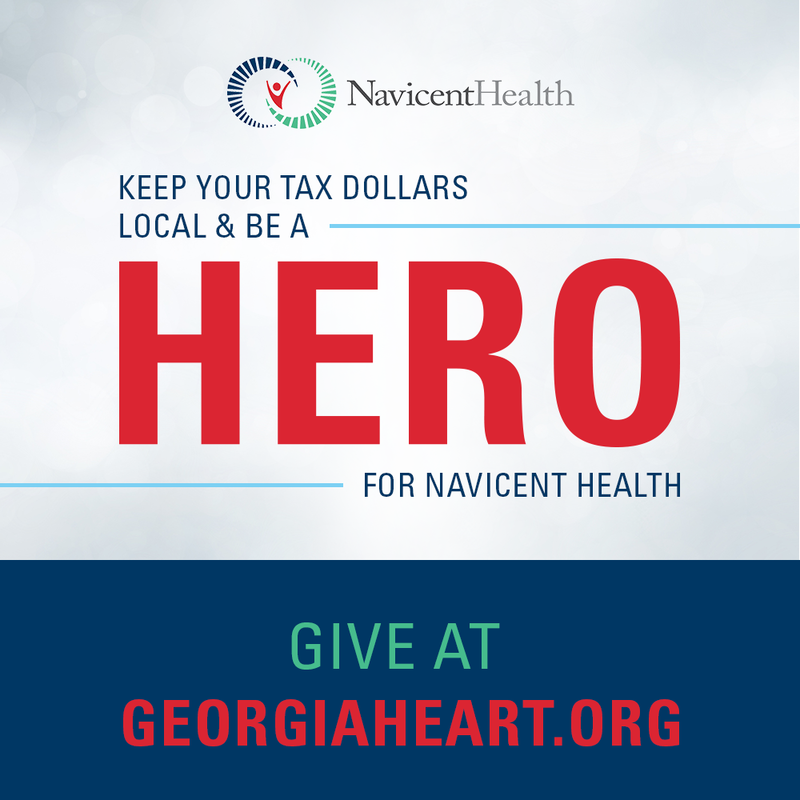 For more information, please visit www.navicenthealth.org.